NOOB GUIDE - Comprehensive Mod Guide! So many people have been joining the server lately and have been flooding the chat with "how do I [insert random act here]?" While I don't mind helping new players, it can be a tad overwhelming when there are people constantly in need of assistance and half the people you help end up quitting the server or quitting rust the next day. With that being said, I decided to type up a "noob guide" to quickly reference people to pretty much all the information they need to know to get started on the server with our current modset. One of the main thing people want to know is how to use the HuntRPG mod and what the skills are that are currently available since the "/hunt skilllist" is currently bugs and shows nothing. Lumberjack = Increased wood from trees per hit. 20/20 max, 1 skill point per rank up. Miner = Increased ore/stone from Rocks per hit. 20/20 max, 1 skill point per rank up. Hunter = Increased supplies from animals per hit. 20/20 max, 1 skill point per rank up. Blacksmith = Increased smelting speed for furnaces that YOU crafted. 5/5 max, 7 skill points per rank up. Tamer = lets you tame animals based on what level of tamer you are, not recommended. 5/5 max, 7 skill points per rank up. Researcher = Lets you research items in inventory, no longer needed due to research tables. 5/5 max, 7 skill points per rank up. 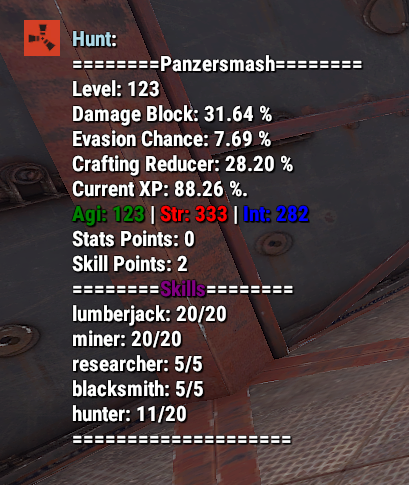 Bringing up your hunt profile will show you how much of each stat you have, as well what skills you currently have ranked up. It also shows you how many skill points and stat points you have, your current exp, your level, and how much block/evasion/craftingreduction you have. So now lets talk about Stats. There are THREE stats in the game with the HuntRPG mod: Strength, Agility, and Intellect. Intellect = Crafting time reduction. That just about covers the HuntRPG mod. Now lets talk about the teleport mod that's included in Oxide (I think?). You can teleport to your friends ONCE per 10 minutes or so (maybe 15 minutes?). You can also set a "home" which you can teleport to about as often as you can teleport to other players. WHILE standing on the foundation that I created. That just about covers how to tp and set your home location. 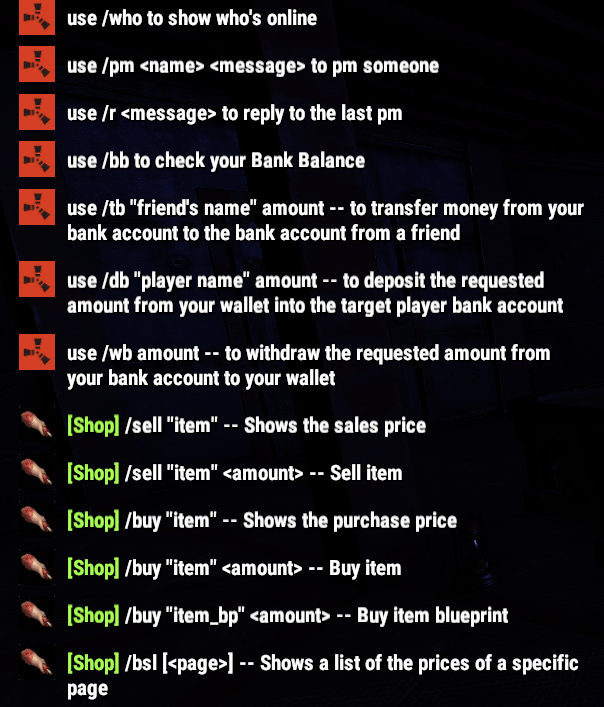 One of the other common things people frequently ask about is the Shop & Bank mod we have. Now all this stuff isn't free, and THINGS HAVE DIFFERENT COSTS AND SELL FOR DIFFERENT PRICES. So you need money right? Well you can get money by selling things in game. Then you can use the money to buy things you need. *tip* bb stands for "Bank Balance* might help you remember the command. Carrying too much money on you can be DANGEROUS. You lose a chunk of however much money you had on you, when you're killed. Money in your bank account is SAFE from this penalty. A LOT of this information can be found in-game with the HELP command. However, since the mods frequently go out of date because of weekly patches etc.... this is a guide to help you keep up with missing information. I hope this guide helps anyone new to the server! Have fun and don't get killed. Re: NOOB GUIDE - Comprehensive Mod Guide! You're welcome! Hopefully people find it useful. Awesome little guide, panzer. I think it'll be a great help. Also can confirm that Dodge works for dodging bullets, heh. And I believe you have a finite number of teleports back to your "home" ? I think it's 15 times every 24 hours? or maybe I'm just misled about that or it's changed, don't know for sure.